For high-performance and luxury cars and SUV's. * Also available in selected sizes in Self Supporting Runflat (SSR) and ContiSeal technology. 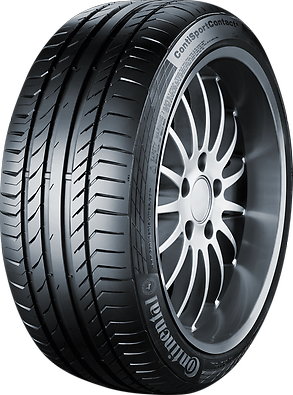 The tested tyre size was 225/40 R18, test vehicle VW Golf VI GTI. In their June issue, Auto Express (UK) has published their annual Summer Tyre Test 2015. The tested tyre size was 225/45 R17 94 Y, test vehicle a VW Golf VII. "Conti tyre feels lively, sharp and eager to turn"
"Second win on the trot in our 17" test for a remarkable tyre"
Rating for the ContiSportContact® 5: "Recommended"
Rating for the ContiSportContact® 5 SUV: "Testwinner"
Rating for the ContiSportContact® 5: "Very recommendable (Testwinner)"
Rating for the ContiSportContact® 5: "Testwinner"
" It doesn't matter if the track is wet or dry: The Test Winner Continental ContiSportContact® 5 rolls not only fast, but also always very securely "
Rating for the ContiSportContact® 5: "Good"
+ "Our recommendation: The best tyres are ContiSportContact® and Goodyear Eagle F1 Asymmetric 2"
Rating for our ContiSportContact® 5: "Highly recommended"
The ContiSportContact® 5 adapts to the road surface, giving improved grip and handling when accelerating and cornering. Featuring Black Chilli Technology. 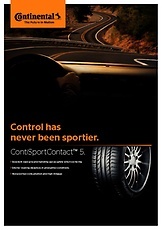 the ContiSportContact® 5 is reactive, giving shorter braking distances on wet and dry roads. The ContiSportContact® 5 was awarded an AutoExpress Best Buy (2013) and is highly commended by AutoBild (2014).